Liu Xiu (5 B.C.-57 A.D.) - After the fall of the short-lived Xin Dynasty, several members of the Liu family (which had ruled the Han) competed for the restoration of their old empire. One of these was a man named Liu Yan. He was a sixth generation descendant of Emperor Jing who ruled from 156 to 141 B.C.. Liu Yan had a brother named Liu Xiu, who fought for his brother. Liu Xiu was the man instrumental in gaining favor of the peasantry on his brother's behalf. 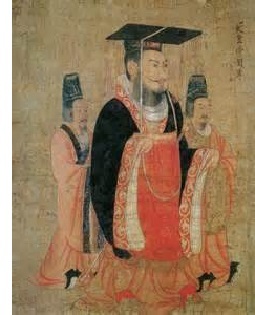 The people were skeptical of Liu Yan's chances of overthrowing Emperor Mang. But Liu Xiu had a reputation for being a reasonable, intelligent individual, and when the citizenry saw that Xiu was willing to risk his own life, they decided to throw their support behind Liu Yan. In addition, Liu Xiu was known for his compassion. After he conquered a town under Xin control, rather than dealing harshly with its residents, he would invite them to join their cause. This further increased support for his brother. At the climactic Battle of Kunyang, Liu Yan's forces (led by Liu Xiu) were victorious over the Xin. However, it was not Liu Yan's faction which ultimately overthrew the Xin Dynasty. While his army was fighting the Xin on one front, another member of the family, Liu Xuan (third cousin to Liu Yan) attacked the Xin capital and killed Emperor Mang. As a result, Liu Xuan officially restored the Han Dynasty and was named Emperor Gengshi. The new emperor realized Liu Yan represented an imminent threat to his reign and executed him after capturing him through trickery. But this is where Liu Xiu's popularity with the people paid off. They refused to accept Emperor Gengshi's rule and deposed him two years later. Liu Xiu was the natural choice to take over and was proclaimed Emperor Guangwu in 25 A.D.. One of his first actions was to move China's capital from Xi'an to Luoyang, thus delineating the Han Empire into what is now known as the Western Han and Eastern Han. Of course, there were still other factions out there attempting to gain power and it took Emperor Guangwu another 12 years to consolidate all of China under his rule. In contrast to Emperor Mang's disastrous reign, Guangwu's was considered highly successful. He married a woman of renown beauty, the Empress Yin Lihua (although he had another wife as well) and ruled until his death in 57.